Looking for a new, unique decorative look without it costing a fortune? Check out TIVA DESIGN’S DIY TILE ART 12 PACK! Get the professional decorator’s look at a margin of the price. 1 square per tile of blue, green, & white with scroll designs arranged with others to make a beautiful creation of art. TILE ART is designed by Tiva Livne whose artistic creations are inspired by the past & future. Her target is to uplift the lifestyle of anyone’s surroundings with as little expense as possible. 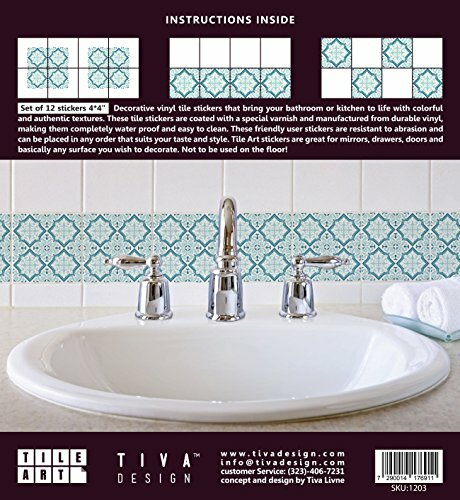 Get your TIVA DESIGN 12 PIECE “AQUAMARINE” TILE ART by clicking the ADD TO CART button. SATISFACTION GUARANTEED: We are confident that you will love our product so please contact us immediately with any questions or concerns; BUY WITH CONFIDENCE the 12-PACK of TIVA DESIGN TILE ART "AQUAMARINE" that will add beauty and spark to any room; redecorate and update your space by quickly applying these unique stickers. If you have any questions about this product by Tiva Workshop, contact us by completing and submitting the form below. If you are looking for a specif part number, please include it with your message.